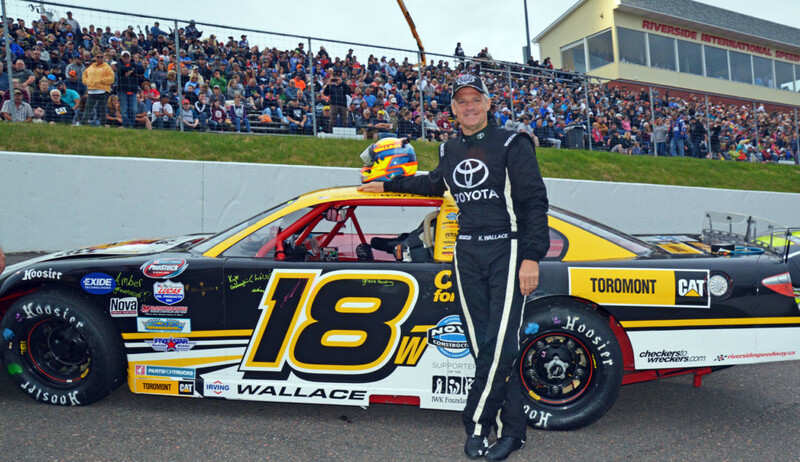 Kenny Wallace, former NASCAR driver and television broadcaster, is returning to Riverside International Speedway on July 20 for the IWK 250 Presented by Steve Lewis to defend his win last year. Weekend Passes for the IWK 250 Super Race Weekend will be available online starting Wednesday (Feb. 20). The value-packed Weekend Pass includes admission for the IWK 250 TestFest and Tailgate Party on Thursday, July 18, the NAPA Sportsman Series Henry’s AUTOPRO 100 and Maritime Legends Challenge on Friday, July 19, and the IWK 250 presented by Steve Lewis on Saturday, July 20. Pricing can be found here. Wallace will again drive a car out of Antigonish’s Nova Racing stable as a teammate to Donald Chisholm, winner of the 2016 IWK 250. During his stay in Nova Scotia, Wallace will visit patients and their families at the IWK Health Centre in Halifax, as well as make scheduled appearances at the track where fans can meet him and get autographs. Fans should tune in to the next edition of Riverside Victory Laps, a podcast which will drop later this week and feature Kenny Wallace and Riverside owner Donald Chisholm, both discussing the IWK 250 with series host Dylan Langille. Victory Laps is available at www.riversidespeedway.ca and on iTunes. Wallace, a native of St. Louis, Missouri, has 905 starts in NASCAR’s top three series and holds the all-time record for the most starts in the XFINITY Series, showing his longevity in the sport. He retired from a 25-year NASCAR driving career in 2015 after scoring nine wins in 547 XFINITY Series starts, one of which came at Bristol Motor Speedway (TN) – which Riverside’s 1/3-mile oval is modeled after. Wallace retired from his television career at the end of the 2018 season to become a full-time racer again, focusing mostly on dirt racing, at short tracks throughout America. Wallace is the son of a well-known Midwest racer, the late Russ Wallace, and brother of fellow NASCAR racers Rusty Wallace and Mike Wallace. Kenny Wallace started his racing career as a fabricator for Rusty before moving into the driver’s seat himself. He won the first race he ever entered, in 1982, in a street stock. In 1986 he raced with the American Speed Association (ASA) winning rookie of the year honors. In 1988 he got his break in NASCAR driving for Dale Earnhardt (Sr.) in the XFINITY Series at Martinsville Speedway (VA) where he finished seventh. With his win last year, Kenny Wallace joined Regan Smith as the only guest drivers to take the checkers in the IWK 250. Other NASCAR racers that have challenged the regions best in the event include Aric Almirola, Marcos Ambrose, Matt Crafton, Ricky Craven, Brad Keselowski, Joey Logano, Mark Martin, and David Reutimann. The IWK 250 is a championship points race with the Parts for Trucks Pro Stock Tour (PST), round six of 12 for the 2019 campaign. Since its inception in 2007, the IWK 250 has helped raise awareness and more than $500,000 for the IWK Foundation. Campsite reservation renewals for the IWK 250 Super Race Weekend are now available and due by March 31. New reservation requests are also available and will be filled starting in April. The IWK 250 Campsite Renewal/Request Form can be found here. The IWK 250 Super Race Weekend will kick off Wednesday, July 17 with practice sessions for the NAPA Sportsman Series and Maritime League of Legends. On Thursday, it’s the IWK 250 TestFest & Tailgate Party. Friday will see the Henry’s AUTOPRO Sportsman 100 and the Maritime Legends Challenge. Saturday, it’s the IWK 250 Presented by Steve Lewis. Celebrations for the 50th anniversary at Riverside will be year-long and highlighted at the IWK 250 Super Race Weekend. Fans can keep up with Riverside news all year long by subscribing to the email newsletter, and by following social media accounts on Facebook (riversidespeedwayns) and Twitter (Riverside_NS).